I am often asked what do I consider essential in my close-up and macro photography. Here in a short video is my key to photography. 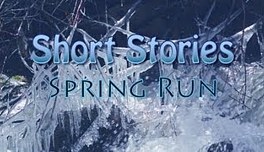 A very short video of the spring thaw here in northern Michigan, as the earth heaves and ice breaks up and turns to water. Spring is always a little late here, but it does come. 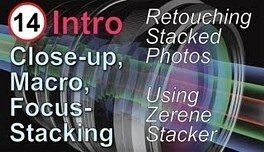 From Macrostop.com with host Michael Erlewine, an introduction to Focus Stacking, shooting multiple layers of photos each at a different focus, producing a combined photo with as much of the subject in focus as is wanted. From Macrostop.com with host Michael Erlewine, an introduction to Focus Stacking, shooting multiple layers of photos each at a different focus, producing a combined photo with as much of the subject in focus as is wanted.From Macrostop.com with host Michael Erlewine, an introduction to Focus Stacking, shooting multiple layers of photos each at a different focus, producing a combined photo with as much of the subject in focus as is wanted. From Macrostop.com with host Michael Erlewine, an introduction to Focus Stacking, shooting multiple layers of photos each at a different focus, producing a combined photo with as much of the subject in focus as is wanted.This segment is more technical. Here are the contents: Photos, specs, and detailed reviews of 8 more common close-up and macro lenses of high quality, to help you choose what lens might be best for you. From Macrostop.com with host Michael Erlewine, an introduction to Focus Stacking, shooting multiple layers of photos each at a different focus, producing a combined photo with as much of the subject in focus as is wanted.This segment is more technical. 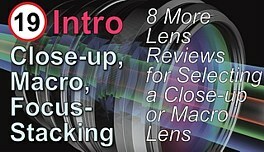 Here are the contents: What are the features to look for when choosing a close-up or macro lens. This video goes into details on what to consider. From Macrostop.com with host Michael Erlewine, an introducation to Focus Stacking, shooting multiple layers of photos each at a different focus, producing a combined photo with as much of the subject in focus as is wanted.This segment is more technical. Here are the contents: Focus rails and how to use them for stacking focus, plus a review of some of the major focus rails. 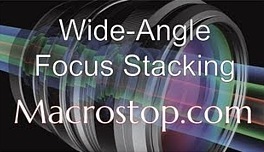 From Macrostop.com with host Michael Erlewine, an introducation to Focus Stacking, shooting multiple layers of photos each at a different focus, producing a combined photo with as much of the subject in focus as is wanted.This segment is more technical. Here are the contents: CONTENTS Includes various comments and suggestions about focus-stacking technique, and general observations. 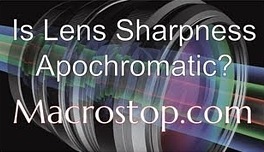 From MacroStop.com and host Michael Erlewine, a short tutorial on pursuing ultra-sharp DSLR lenses to the limit, in this case until sharpness turns into questions of apochromatic rendering of light. 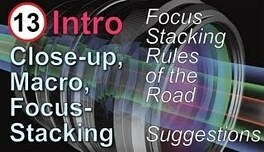 From MacroStop.com and host Michael Erlewine, a short tutorial on the new technique of taking stacking video frames (motion stills) and an easy-to-use follow focus.